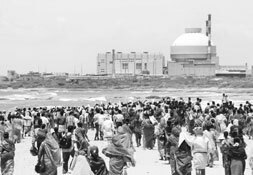 Koodankulam: Shoddy equipment develops leaks – by Sam Rajappa | कृति मेरे मन की……. अरुन्धति राय ने भी सरकार पर तीखा कमेन्ट करते हुए कहा कि सरकार सामान्य रोज बरोज का कचरे का निपटारा तो कर नही पा रही है। फिर परमाणु कचरे का निपटारा कैसे करेगी? The same clause also says the NSRA “shall not interact with bodies outside India without the prior approval of the government.” The subservient nature of the proposed NSRA has been made abundantly clear in Clause 48(1) which says: “the Central government may, by notification, supersede the regulatory authority for such a period not exceeding six months. Upon notification, the chairperson and members of the NSRA shall vacate their offices as such; … all the powers, functions and duties shall, until the authority is reconstituted, be exercised and discharged by the Central government.” The NSRA can never be independent unless the appointment of its chairperson and selection of members of the regulatory authority as well as supersession of the NSRA are left to Parliament and not to the ruling party of the day.